This is the final installation on miniatures that can be used as Forest Gods, and covers the giant wolves belonging to the Tribe of Moro. 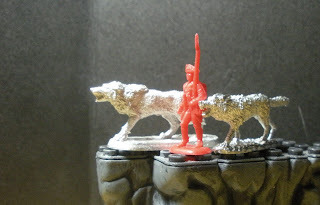 The first miniature below, is Fenris Wolf from the Marvel HeroClix line (Hammer of Thor #46). I really liked the way this wolf was sculpted, and the look is really close to the character design for Moro in the movie, but it is much too large for a 1/72 representation. The second miniature is a Vampire Dire Wolf (Unhallowed #59) from the Dungeons and Dragons Miniatures line. The figure has a bit more bulk than I would have liked, and the slavering jaws are a bit too wide, but it wouldn't make for a bad representation of Moro either. 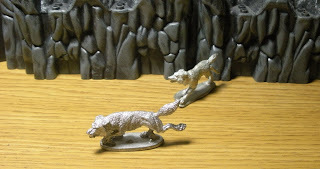 The first miniature in the next image below, is a Winter Wolf from the DDM line (Underdark #60). Somehow it did not look quite the same as the image that is used in the advertisements for it. The head has an odd appearance, and the limbs are very thick. Not a very good sculpt in my opinion. 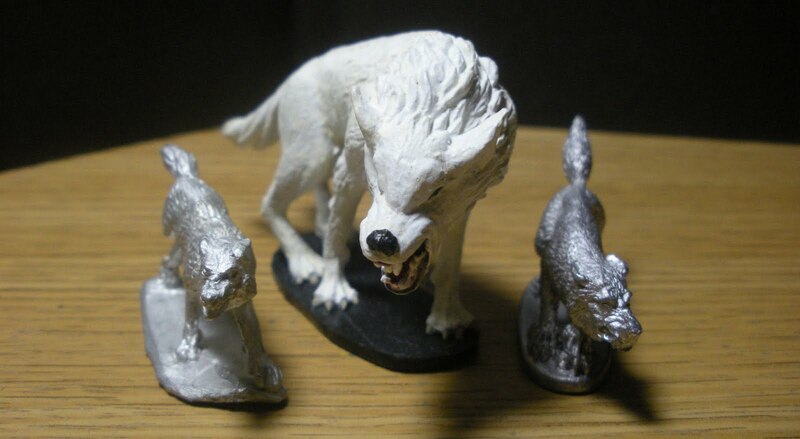 Also with the Winter Wolf are a Giant Wolf from the Legion of Darkness Wolf Pack set (RAFM 3200), and a Dire Wolf from Reaper (2415). In this next image, is a Dire Wolf from the former Dazed Miniatures line. I believe that it will be available in a slightly modified form in the future from Acheson Creations under their Primaeval Designs line. 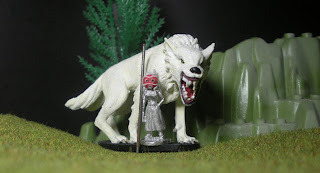 It is followed by a Warg from the Grenadier Lord of the Rings line, and last is a Dire Wolf from the Horrorclix line (Base Set #019). The next wolves are five of the seven wolves from the Ral Partha Wolf Pack set (01-035). This is a mix of wolves of different style, some of which appeared in other sets. The image below compares a Mage Knight Glade Guardian, which is a plastic version of the Ral Partha wolf from the Wolf Pack set (above); a DDM Timber Wolf (Deathknell #27); a Great Wolf of the Night from Ral Partha (Wizards, Warriors, And Warlocks E691/W691); two wolves from the Reaper Wolf Pack (02830). The final image begins with a Great Wolf from the Ral Partha Fantasy Collector Series; a Citadel Devil Dog (FF10-1); a Great Wolf from the Armies of Arcana line (formerly of Thane's Games and now available from Lone Gunman Games); a wolf from the Grenadier Wolfpack set (Fantasy Legends 3111); and a wolf from the Reaper Familiar Pack I (02018). Even with this many choices, it was difficult to find a good representation for the wolves in the film. One of the main problems was the inconsistancy in size for the wolves in different scenes. 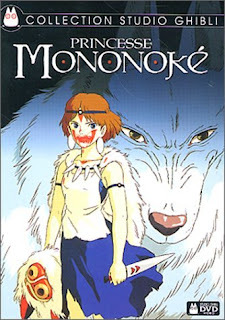 For my choice to represent Moro, it was either the Vampire Dire Wolf, or the Winter Wolf. Frankly, I felt the size of the Winter Wolf was probably closer to how big Moro should have been, but the miniature was just too ugly for me to use. 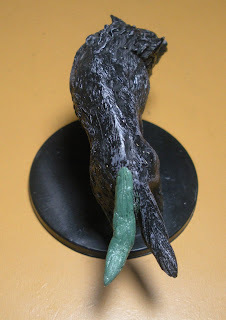 To convert the Vampire Dire Wolf into Moro, I chopped off the various spikes protruding from the wolf (I guess nowadays when a creature is labeled "dire," it is assumed to be both larger, and covered in spikes), and carved away some of the fur, so that the figure would look a bit leaner. A pin was inserted into the base of the spine as an armature, and a second tail was sculpted from Kneadatite. The figure was then painted in white, and dry brushed with a yellowish off-white color. For the two Sons of Moro, the choice was a bit harder. I picked three pairs of different sized wolves as candidates. The first pair would be the Reaper or RAFM wolves. 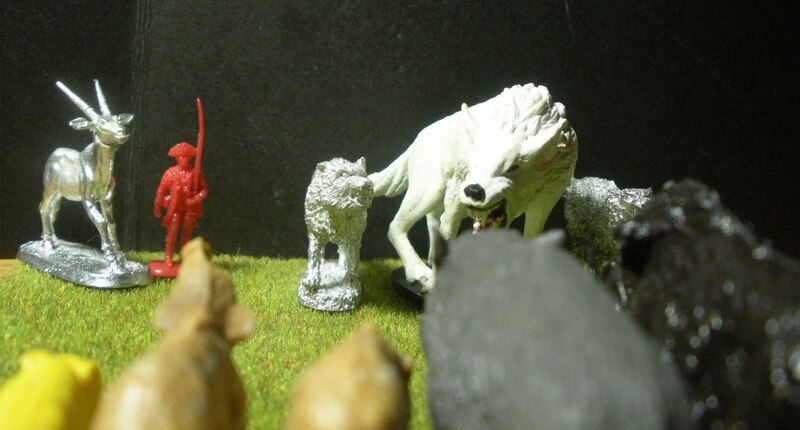 In some scenes, the Sons of Moro are depicted as being really huge, and these miniatures actually look the best in relation to the Vampire Dire Wolf as far as size is concerned. The next pair would be the Grenadier Warg and Dazed Dire Wolf. This pair is really nice because of their dynamic running poses. 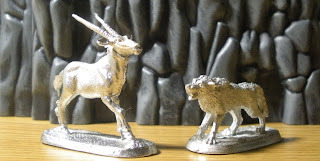 They look fine in relation to the Vampire Dire Wolf, but they don't look good compared to human sized figures or the Gemsbok. Maybe it is because their heads look too big compared to the animated wolves. 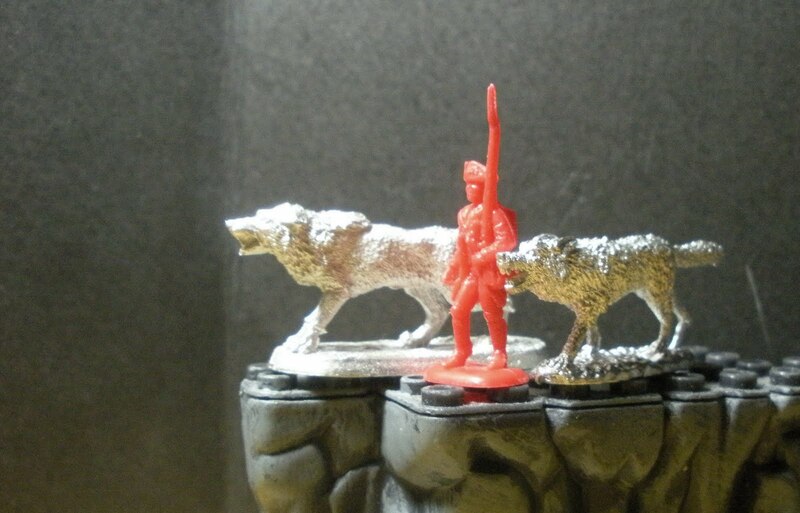 The final pair are one wolf each from the Reaper and Ral Partha Wolf Pack sets. 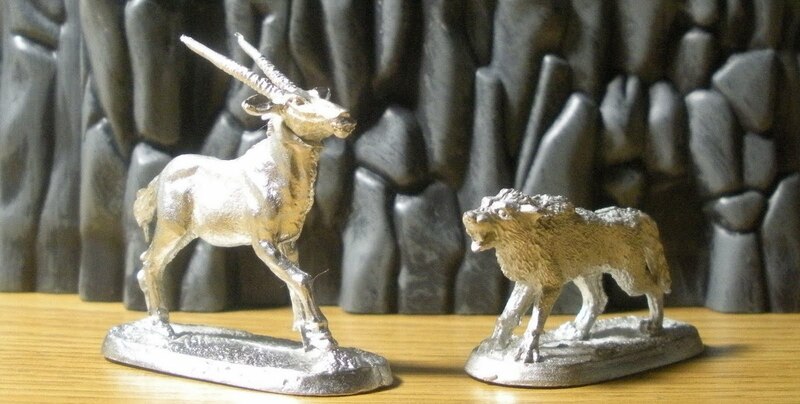 These two wolves look good in size compared to humans and the Gemsbok, but unfortunately they look too small compared to the Vampire Dire Wolf. They do however look in scale when posed with the Winter Wolf. At the moment I'm leaning towards going with the final pair of wolves, but that means I'll need to find a replacement for Moro. 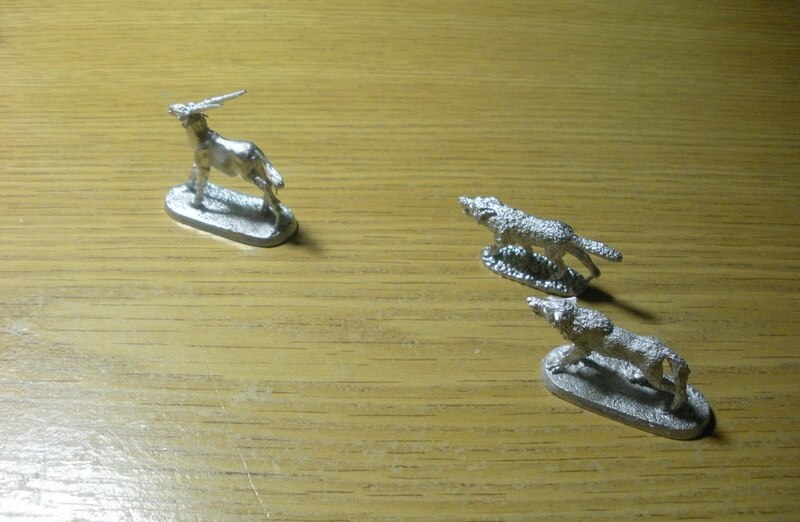 Who makes a nice wolf that is about 30mm to the shoulder? Very nice work! I really find your posts interesting and helpful in my search for models too. Thanks!